The objective of this module is to equip students with a fundamental understanding of the technology underlying the field of computer images and how this is applied to advanced areas such as geometric modelling, rendering and animation. We will discuss modes of input/output and the limitations/potentials of (graphical) digital media and attempt to provide a better understanding of the workflow, complexity, tools and issues involved in production of digital images, animations and interactive graphical programs. Students are introduced to some mathematical principles and standard architectures of modern graphical applications, including details of the hardware and low-level software used in such systems. The course will give an understanding of how low-level fundamental components common to all computer applications come together to produce the high-level abstract output in graphical applications to generate computer imagery. PLEASE NOTE that for the Semester 2 we will have a series of smaller assignments compared the previous semester. Most labs will now be graded. All assignments (with the exception of Assignment 1, which may be sent in by email) should be submitted via the Blackboard system at mymodule.tcd.ie. This system will also be used to return individual feedback on assignments. If you have major problems accessing or submitting through the Blackboard system, please contact me as soon as possible. Mondays 11am-1pm throughout Semester 1 and 2 in 3rd Floor, Westland Square. Generally, this will consist of a theory lecture followed by a practical session. Some labs are not directly marked but contribute towards the development of the major assignments. 100% by continuous assessment and coursework. More details shortly. This course is not based on a single text but the following are useful supplementary readings. Computer Graphics with OpenGL (3rd Edition), Donald Hearn and M. Pauline Baker. Prentice Hall. 2003. 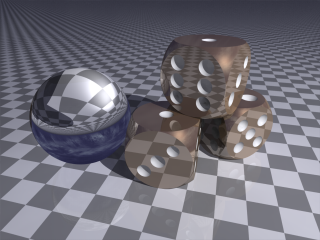 Computer Graphics: Theory Into Practice. Jeffrey J. McConnell. Introduction to Computer Graphics, James D. Foley, Andries van Dam, Steven K. Feiner, John F. Hughes, Richard L. Phillips. Addision Wesley Professional. 1993. The Computer Image, Alan Watt and Fabio Policarpo. Addison Wesley, 1998.